On a 1600, I don't measure the dogbone, I set the distance while on the car. The car should be able to idle without the bones attached. Balance the carbs and set the idle with bones disconnected. I then connect and set each dogbone one at a time so that at idle, there is zero pressure on the throttle side. Very small turns in and out will reveal that "just right" position very nicely as the idle will change if you are exerting pressure either way. Lock it down when set, then double and triple check as they are finicky! you set up the carbs to where you want them and then adjust dog-bones to suit. Really . Without the dogbones attached ? With only the idle screw then ? Ok . Then set dogbones .. that's different then I've been doing it for sure . Ok thanks .. I'll do this today . Anybody know what size the bolt is that holds the hood to the hinge? I opened my hood today and evidently one of the bolts on the passenger side has gone awol. Additionally, when I measured mine, they were 3/4" long. I have NO idea where this heater line goes to. I can't see ANY spare wires coming through the firewal. If you are talking about the yellow wire, it probably goes to the temperature sender. There should be a yellow wire in the harness somewhere there on the drivers side inner fender. Look near the wires for the washer pump. It usually has a black plastic sheath. Can heat from the header heat up a starter to the point of failure? My 13 month old starter isnt doing its job anymore, its spinning but its not spinning the motor. Do I need to replace the entire starter or can I replace the solenoid? Anything I can do to prevent this in the future?? For the work involved in the R&R of the starter, I would just go ahead and put in a gear reduction starter and be done with it. It’s a reasonable cost, and smaller. Yes, I believe the heat in that area contributes to a shorter life. Gear reduction starter is smaller so may allow more airflow and a longer life, just an assumption, not fact based. Regardless, starters were never an annual replacement item. Many of these cars have starters that are 10 years old or more. I have no idea how old my '68 2000 starter is but the starter on my '69 1600 is 6 years old. 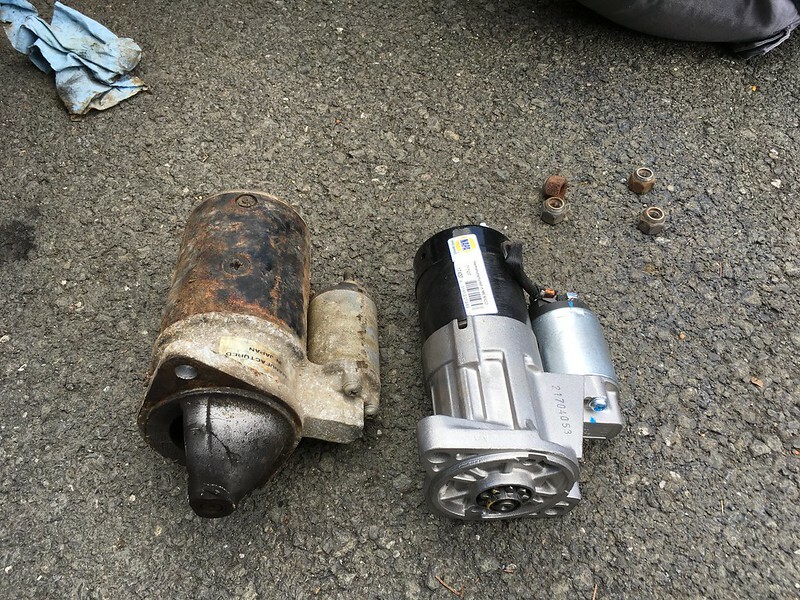 Have you taken the starter to an auto parts store to verify that it's faulty? Is is possible there is some other fault here? Loose bolts, slipped ring gear, missing or badly worn teeth on the flywheel, poor connections, etc?